As Christmas approaches, families are going on shopping sprees for gifts, groceries, clothes and everything that's on sale. As a business, you need to stay ahead of your competition, and start your promotions early. 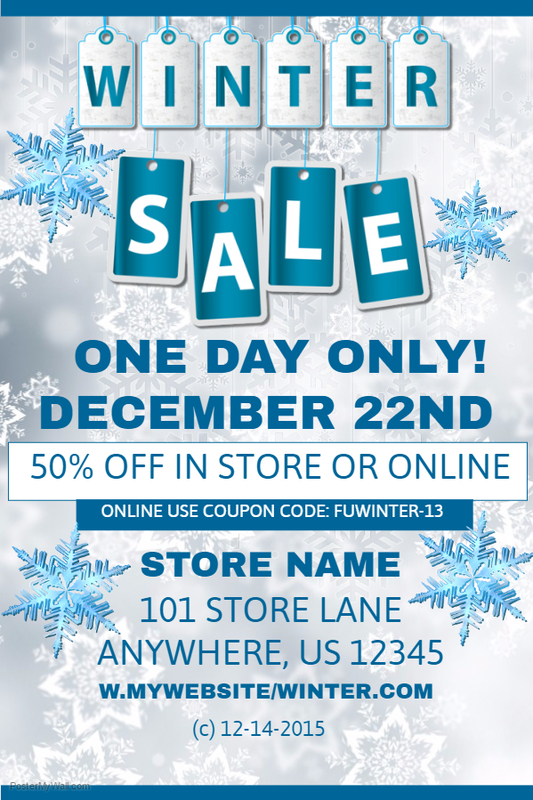 If your promotions are successful, customers will make you their go-to for Christmas shopping. And these days, what better way to reach the vast majority of your customers than through social media? Be sure update your social media frequently, alerting customers of your current offers. Your audience will shy away if they see that your last update on your social media page was a year ago. Be prepared to go the extra mile by investing in Facebook Ads. This way, you can reach out to even more people, and not just the people who like your Facebook page. So how can PosterMyWall help? Well, PosterMyWall offers a Facebook Ad size. Creating social media ads is an easy task with our design tools. Also, your Facebook Ad should feature your products and sale in a concise manner, while using high quality imagery. You’ll find the Resize button at the top bar of the poster maker, where you will find resize options for all kinds of formats, including Facebook Ad size. But let’s not forget offline marketing. You’ll need posters - lots of them! PosterMyWall has your back! 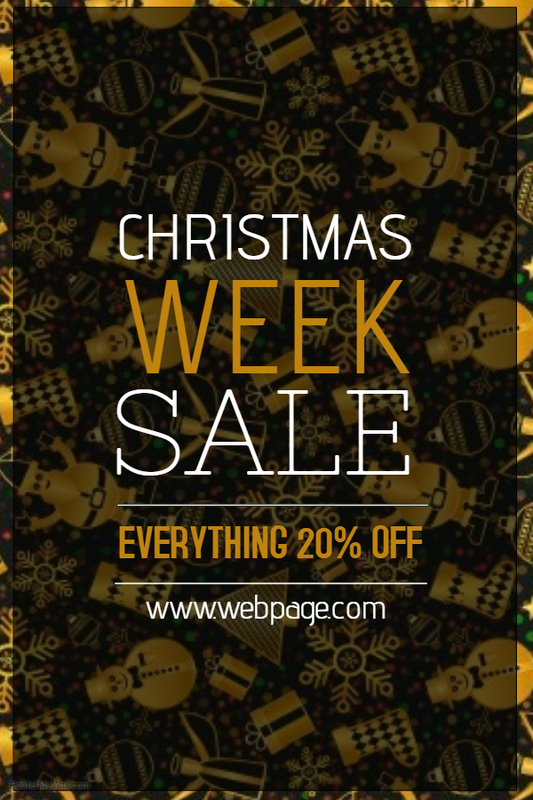 We offer the poster size, and loads of christmas themed retail poster templates. Below are some of our most customized Christmas retail templates. You can customize any of these templates by clicking on the templates of your choice to be taken to the PosterMyWall Editor. Many of our poster designs have a natural setting behind it, often displaying a Christmas tree or decor. It gives a fresh look to the poster. If you’re looking to design a poster or flyer with an atmospheric feel, go for stock photos that will make your job a lot easier. Try Free Nature Stock. There is a lot of marketing noise generated because of the sheer amount of competition. Create Harmony in this Chaotic landscape through poster designs that reflect this notion. A minimalist design is rarely seen in retail, and it will definitely make you stand out. Red is the color of passion and activity. It’s vibrant and grabs the attention of your audience faster than other colors. Use it with complimentary or neutral colors such as, green, yellow, orange, black and white. Blue is the color of trust and loyalty, and while it’s not quite as energetic and noticeable as red, it goes well with the winter theme, especially of a fabled winter wonderland. Use this color with complimentary or neutral colors such as yellow, white and lighter shades of blue. If you want to save up on printing, black and white is the way to go. It also saves on time, because you don’t have to decide which colors mix and match well, and the results are just as impressive! PosterMyWall offers an integrated system which allows you to access stock photos from within the Editor. This means you don’t need to search for images on other websites, download them, and then upload them onto your design. You will find images from Storyblocks, Getty Images, Flickr and Pixabay. You can use images from Storyblocks, Flickr and Pixabay freely, but premium images from Getty Images require a small fee, otherwise your download has a watermark on it. Stock photos, when used correctly, make your poster look stunning. Use them as a background rather than as individual images. Check out this blog post to find other websites you can use to get stock photos for free.